A blend of pork blood and beef fat, mixed with oats, barley and spices. Our special family recipe. 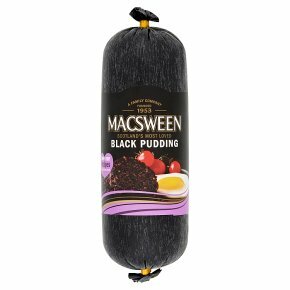 Making black pudding with passion. Contains no artificial flavours or colours. Guide onlyThis product is already cooked and requires heating until piping hot.Defrost first if frozen. Consume within 3 days of opening. Slice the product to approximately 1.5cm thickness and remove packaging. Pre-heat grill to medium/high heat and grill for 10-12 minutes, turning occasionally throughout cooking. Fry in a pre-heated, non stick pan over a medium heat for 7-8 minutes, turning occasionally throughout cooking.